There are two major conditions necessary to create an organizational culture change: first, there must be a compelling reason to change and, second, there needs to be a leader who will engage organizational members in change. In their recent book, Unleashing Human Energy through Culture Change Don Rust and Alan Weinstein tell the story of how a major manufacturing plant of General Motors, two weeks from closure, not only changed its culture but set a world record in production. How did this happen? Here is the story. Shortly after Don Rust was promoted to plant manager of General Motor’s (GM) Tonawanda Engine Plant in Western New York, he was summoned to Detroit and told by the president of GM that if he did not get work for the plant and finalize an agreement with the United Auto Workers (UAW), the plant would be closed in two weeks. Don returned to the plant with the first condition for a culture change: the need to save 4,500 jobs by keeping the plant open. He recognized that to do that he would need the cooperation of his management team and of the UAW leadership. If outside observers were looking at the plant culture, they would conclude that there was no way this plant could change. The conflict was too deep. Even within management, there was resentment and blame for the sad state of the plant. Don inherited a mess, but he was not to be deterred. He knew he had a compelling reason for cooperation and he seized it. Don convened a team of managers and UAW officers to communicate the message from corporate headquarters about the plant closing. He told this group they needed a plan to keep the plant open, and that it would require getting new engines to build and a partnership between labor and management. He challenged everyone to work with him to create the plan. 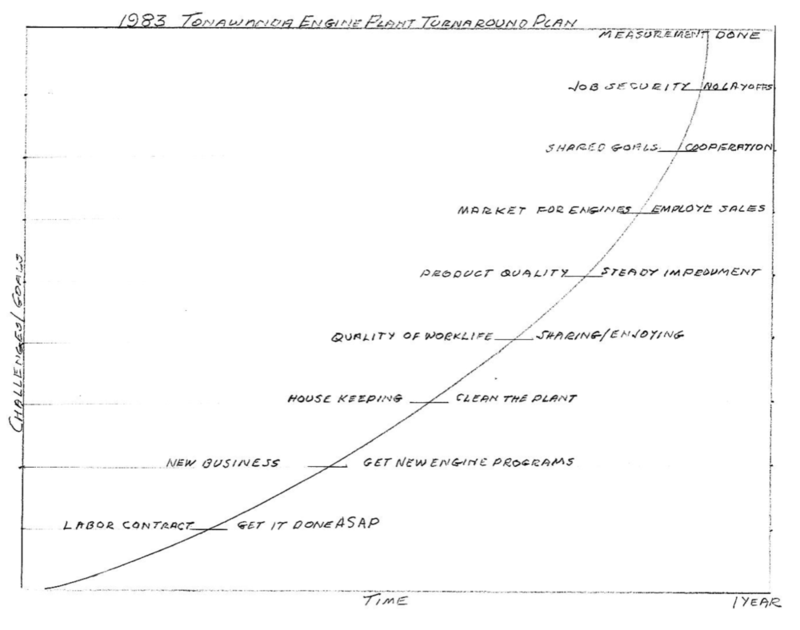 Together, starting with a blank sheet of paper (see below), they developed a turnaround plan that would not only save the plant, but would also create a new era of cooperation between manager and worker. In other words, a culture change. In addition to signing a labor agreement and getting work for the plant, the plan incorporated all aspects of production, including product quality, housekeeping, shared goals, quality of work life, and worker participation in the marketing of the automobiles that used the engines being built in the plant. Don knew that to get the cooperation of the union, he needed to address the most important issue for them: job security. He promised the union that as long as he was plant manager, there would be no layoffs unless the economy was so bad that his own job was threatened. This was a bold promise, but he needed the cooperation of the union to implement the turnaround plan. With the help of his engineering team, Don was able to win a contract to build two new GM engines. He was also able to sign a labor agreement and win the confidence of the UAW to become partners in implementing change. Over the next few months, many changes took place at the plant. For example, bully managers were eliminated , workers were involved in the selling cars by extending discounts to their friends and relatives, the plant was spruced up both inside and outside, a major initiative to improve product quality had begun, the plant celebrated holidays and successes, ways were found to make work more interesting, and workers were involved in major decisions related to equipment and work flow. Don’s philosophy was simple. He had faith in his people to do the right thing. He trusted in their judgement and commitment to succeed, and he respected them by creating a culture that supported them as people and partners in managing the plant. Workers at the plant reciprocated by unleashing their energy to help make the turnaround succeed. There was no better way to demonstrate this commitment of management and labor than to set a world record for the number of engines produced in one day. This was a voluntary exercise in a unionized plant to show the world that the secret of success is to create a culture of trust and cooperation. To this day, two decades after Don retired from his job as plant manager, the Tonawanda Engine Plant remains as a shining example of a high-performance culture.